Traffic managers are conducting an inquiry after the closure of the Hindhead Tunnel in Surrey caused gridlock in surrounding roads. The tunnel, which diverts traffic on the A3 London to Portsmouth road at the Devil's Punch Bowl, was closed for three hours on Thursday evening. The Highways Agency said the closure was caused by a power cut, possibly as the result of bad weather. "We are always prepared to learn lessons," said spokesman Mark Powell. 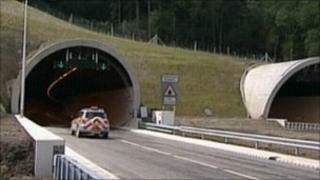 The tunnel, which normally handles 30,000 vehicles a day, has not suffered a major closure since it opened in July. BBC Surrey reporter Emily Jeffery was stuck in northbound traffic as the tunnel shut just after 17:30 GMT. "I was about 20 or 30 cars back from the tunnel, which was completely dark," she said. "It was absolute gridlock. We all sat there for about an hour and a quarter. "It was teeming with rain. Several people were getting out of their cars and some were trying to turn back off the slip road but there were a lot of articulated lorries which made that difficult." The Highways Agency diverted traffic via Farnham on the A287 and A31. But some vehicles tried to use the old A3 through Hindhead, not realising it had been dug up, and came to a dead end at the National Trust car park. Mr Powell said there was a general power cut in the Hindhead area. "When the full power came back on we identified a problem with the tunnel system and decided to close it to put it right. "Our top priority is the safety of people driving through the tunnel and we don't want drivers going through it unless all the systems are working. "A full investigation into the closure is taking place today. "We are not just looking at Hindhead and the systems there but also how we dealt with the traffic. "If there is anything we can do better we will do that in future."